A fast-moving wildfire that ravaged a Northern California town Thursday sent residents racing to escape on roads and claimed the lives of an unknown nuber of people. The 70,000-acre blaze continue to destroy more structures Friday. The director of the California Governor's Office of Emergency Services Mark Ghilarducci said Friday that there are also injuries in the fire and that the magnitude of the destruction is unbelievable and heartbreaking. Witnesses reported seeing homes, supermarkets, businesses, restaurants, schools and a retirement home up in flames. Officials say the thousands of structures in the hard-hit town of Paradise were destroyed and at least 40,000 people have been displaced. Overall, Office of Emergency Services says fires across California, including two major ones in Southern California, have forced 157,000 people from their homes. 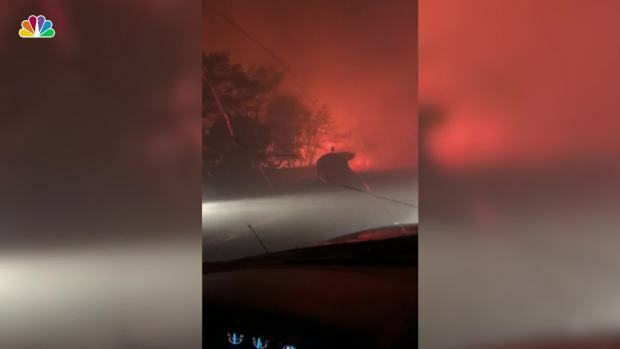 "We were surrounded by fire, we were driving through fire on each side of the road," said police officer Mark Bass, who lives in Paradise, where harrowing tales of escape and heroic rescues emerged after the entire community was ordered to evacuate. Bass evacuated his family and then returned to the fire to help rescue several disabled residents, including a man trying to carry his bedridden wife to safety. Cal Fire Capt. Scott McLean estimated that several thousand buildings were in Paradise, which is about 180 miles northeast of San Francisco. "Pretty much the community of Paradise is destroyed, it's that kind of devastation," he said. The National Weather Service issued red-flag warnings for fire dangers in many areas of the state, saying low humidity and strong winds were expected to continue through the evening. The Camp Fire in Paradise was reported shortly after daybreak in a rural area. As of Friday morning, it had consumed more than 70,000 acres, more than twice the size of San Francisco, and firefighters had contained 5 percent of the blaze, according to officials. In the midst of the chaos late Thursday, officials said they could not provide figures on the number of wounded, but County Cal Fire Chief Darren Read said at a news conference that at least two firefighters and multiple residents were injured. Meanwhile, portions of Southern California remained under siege early Friday as two large fires threatened numerous Ventura County communities. 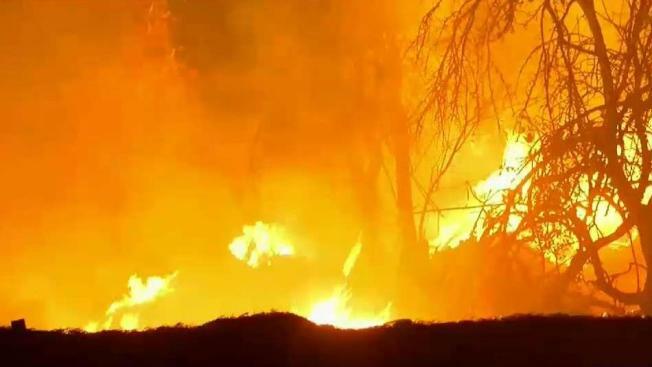 The fire in Southern California was being whipped up Thursday evening by powerful winds that pushed it through canyons and to the edge of Camarillo Springs and Cal State Channel Islands, both of which were evacuated, The Los Angeles Times reported. The blaze broke out in the Hill Canyon area and in just 12 minutes jumped the 101 Freeway. By Thursday evening, it had scorched up to 8,000 acres and sent residents of more than 75,000 homes fleeing. Associated Press writers Jocelyn Gecker, Paul Elias, Janie Har, Daisy Nguyen, Olga R. Rodriguez, Sudhin Thanawala, Juliet Williams, Sophia Bollag, Michelle A. Monroe and Jennifer Sinco Kelleher contributed to this report.